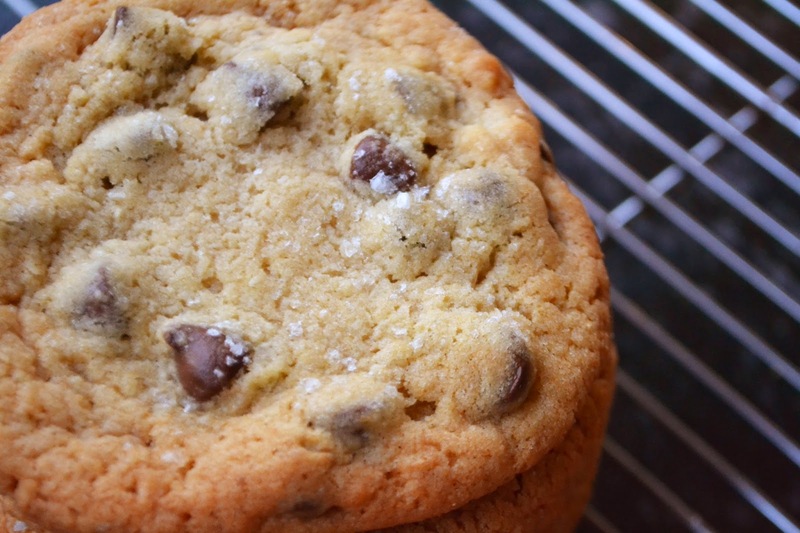 Question: What makes your ultimate chocolate chip cookie? Mine is crispy on the edges, soft and fudgy in the centre, bursting with chocolate chips and with a salty kick to it. That sweet and salty thing that's so trendy right now definitely blows my skirt up! I actually developed this recipe based on the Momofuku Milk Bar method of making cookies. 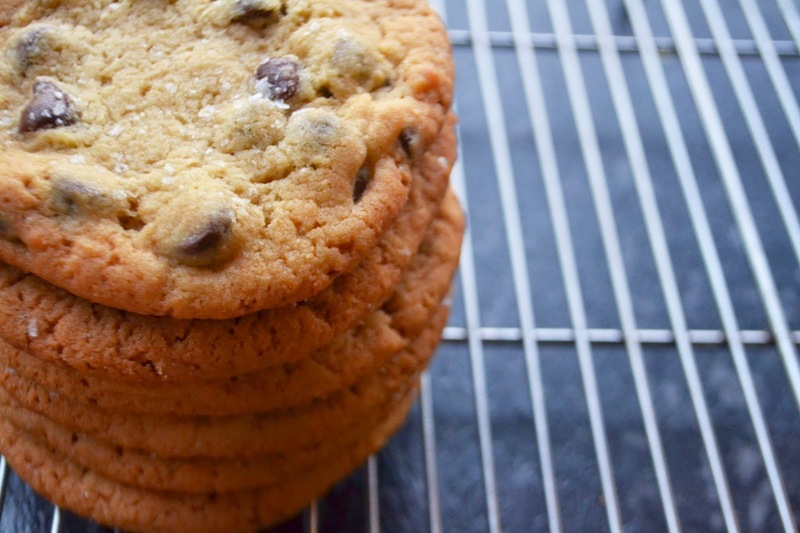 I love, love, LOVED the Milk Bar Corn Cookies but I wanted to make my own version of a classic Chocolate Chip Cookie. Read on for my recipe! These are massive, completely ostentatious cookies that are larger than the size of your palm (well, larger than my palms and I have man hands). In other words, the best kind of cookie! You can obviously make them in a daintier, smaller size, but where's the fun in that? I sprinkle these with sea salt midway through baking. While there is salt in the cookie dough itself, the sprinkle of salt on top gives you an immediate salty smack in the mouth when you bite into it before it melts into sugary sweetness. 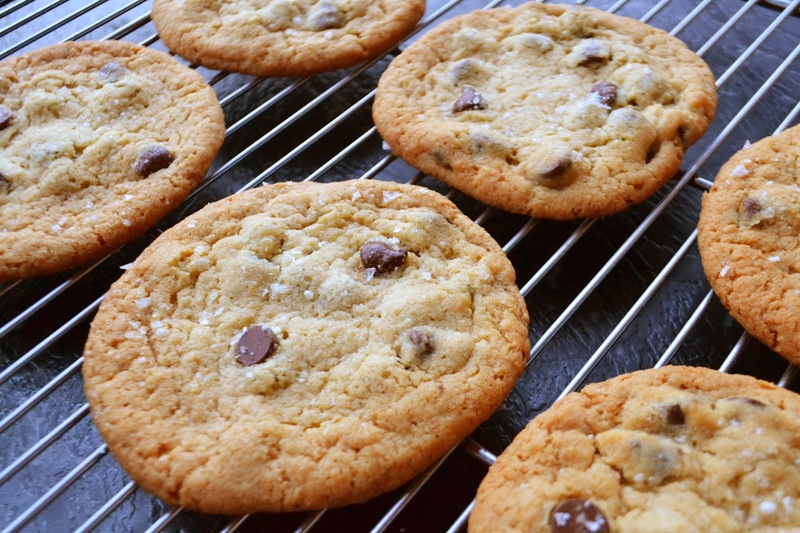 One thing you absolutely must do is use DARK CHOCOLATE CHIPS! I always used to make cookies with milk chocolate as I had it in my head that I didn't like dark chocolate. Oh the misguidedness of youth! Then I always wondered why my chocolate chip cookies were so sickly sweet and unappealing. I finally cottoned on that you need a little bitterness to balance the sweet and thus my obsession with dark chocolate began. 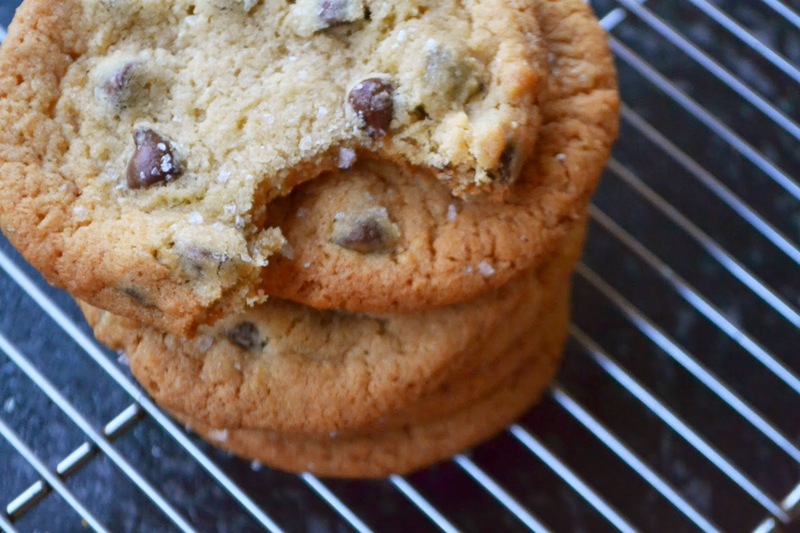 Make sure you use sea salt flakes to sprinkle the top of your cookies. Table salt will be far too salty and salt out of the grinder is way too fine and again, can leave your cookies very salty. There's a fine line, people! There's also coconut in this recipe; I think it's a necessity, but if you don't like it just replace with the same amount of bread flour. Beat butter, sugars and salt in a stand mixer on high for 7 minutes, scraping down the sides as you go. Crack in the cold egg and beat at a high speed for a further 3 minutes. Splash in the vanilla at this point too. The mixture should be fluffy and pale in colour. Mix together the flour, coconut, baking powder and bicarb soda in a bowl and add to the butter mixture. Beat on low for 30 seconds or until the flour is just incorporated. Throw in the chocolate chips less 1 handful and mix on low for another 30 seconds. Using a large spring loaded ice cream scoop, scoop out balls of dough on a lined cookie sheet. Stud with the remaining chocolate chips. Freeze for 2 hours minimum or overnight if you have the time and the patience. Preheat the oven to 150ºC and place the frozen cookie dough balls on a lines baking tray with plenty of room to spread. Bake for 10 minutes, pull out and sprinkle cookies with sea salt. Bake for a further 3 - 5 minutes or until golden and crisp at the edges and just set in the centre. Allow to cool on the tray until the bottoms are set before transferring to a wire tray. Try to restrain yourself from eating the entire batch. 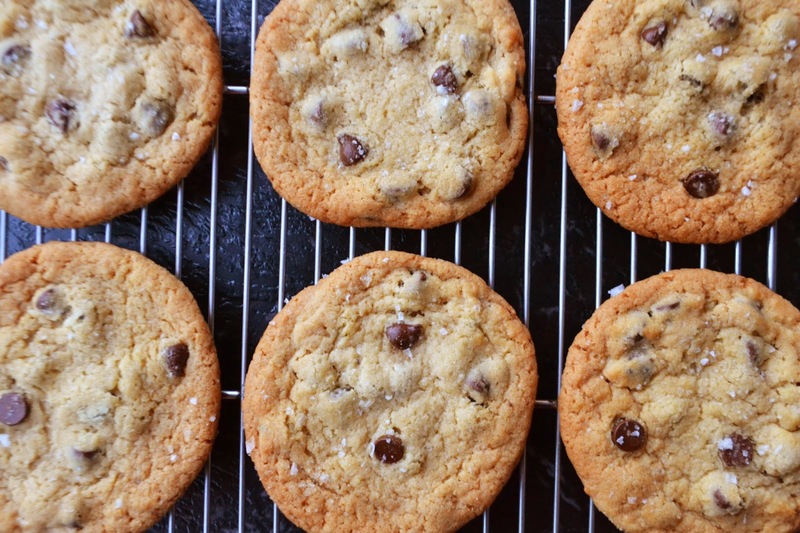 You cannot go wrong with chocolate chip cookies. Never! Haha! And what's great with this is that these are larger than a person's palm. That sea salt you added must be the finishing kick to this awesome recipe. I gotta try these out once I make a tray of these bad boys! I might as well sign up for doing the tenth instruction multiple times. Thanks for sharing!